If what you’re looking for is a conveniently located hotel in Hua Hin/Cha-am, look no further than Putahracsa Hua Hin Resort. The resort blends a serene residential feel with chic urban living, allowing guests to relax in this charming town. With its convenient location, the property offers easy access to the city’s must-see destinations. The property is separated by 2 zones, the Resort side and the Oceanside. The Resort side is the main property area that features 36 Silksand rooms, 8 Silksand Deluxe and 8 Sansky rooms. 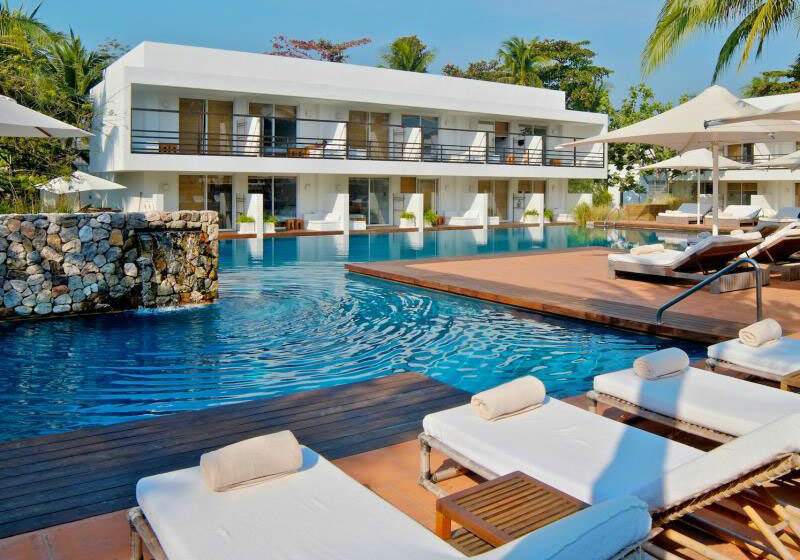 A broad range of facilities such as restaurant, bakery and pastry shop, swimming pools, Putahracsa Day Spa, fitness studio, the Diaries boutique are also provided and this section of the property is approximately 200 meters from the beach. Make sure to stop by the property‘s very own European bakery and coffee shop, where the guests can enjoy a wide selection of homemade pastries, fresh breads, sandwiches, coffee and tea. On the other hand, the Oceanside of the property is the beachfront area where 7 Jacuzzi Villas and 8 Pool Villas are located. Top features of the Oceanside zone includes Oceanside Beach Club and Restaurant, beach bar, swimming pool as well as a designated lobby for the villas. As the sunsets are usually around 05:30 PM, a wealth of candles become the light source as the beach club kicks into action. Deep-seat oversized sofas covered by a mountain of loose cushions become the ideal place to sit back, chill and sip the night away. When you are looking for comfortable and convenient accommodations in, make Putahracsa Hua Hin Resort your home away from home. Short Description: If what you're looking for is a conveniently located hotel in Hua Hin/Cha-am, look no further than Putahracsa Hua Hin Resort. The resort blends a serene residential feel with chic urban living, allowing guests to relax in this charming town.